Yet again, I slept badly and have been awake since a ridiculous hour. This happened yesterday as well. Friday night we didn't make it to Guildford as I felt really rough. And sad, too. I went to bed about 9pm and shed a few tears before sleeping. Yesterday though was a much better day so I thought I'd sleep better. Obviously not. Anyway, here's the lucet in progress. My tension's a bit ropey (doh) but will improve once I get into a rhythm. I do find the lifting of the lower thread over the working thread with my fingers a bit clumsy though - anyone else find this? Might try it with a hook or something. I might also look out for a smaller lucet at Ally Pally (yay! more things to buy!) as I did try it with some finer crochet yarn but it just seemed to be all wrong. I've never really had regular sleep patterns. Can swing from insomniac to sleep monster without much trouble, which doesn't help with my sense of time. Before Tom m oved in, I used a to keep a few things beside the bed to keep me occupied whenever I woke up. 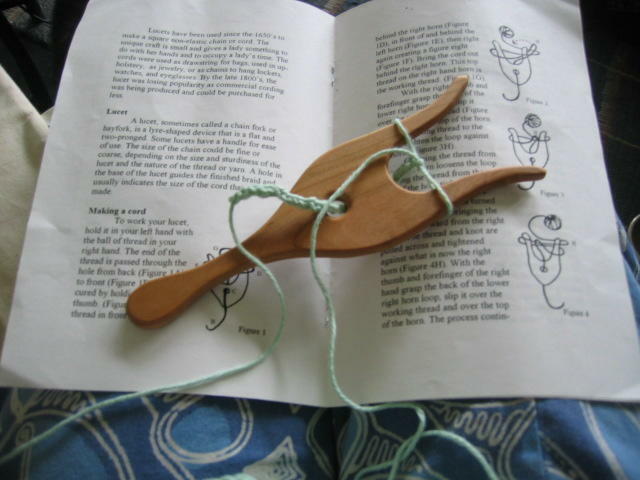 One such thing was this Japanese braiding card; I found the rhythm of moving the threads rather good for making me fall asleep again. It's a slow growing braid, 16 strands. Tom was the last to work on it, and it seriously is as strong as rope - very dense. I'm not sure if it will ever be finished, and what I'll do with it. It's not really my sort of colour scheme. The cards are based on the Japanese braiding stools, the Marudai, where the threads are tensioned by the weight of the bobbins (a bit like bobbin-lace making). The cards are ok, re-usable although the threads can wear a bit from the slots. I've two other kits for similar 8 strand braids waiting to be started. The patterns do fascinate me though, how they're constructed etc. Reckon the Japanese methods are my favourite of the braids. Tom's got to work again this morning so I'd better wake him up. Then this afternoon it's Sheila's birthday bash in Brixton or Battersea or somewhere beginning with 'B'. Should probably try to get some sleep.